I had the opportunity during a recent trip to California to drop in on the fabulous folks at Savas Beatie. It was a quick trip, so managing editor Ted Savas and I only had time to talk about smoking cigars rather than actually smoke any. “Next time!” he promised. Savas Beatie is the leading commercial publisher of Civil War books, and as ECW’s readers know, the company has been very good to Kris White and me over the past few months. Through Ted’s vision and enthusiasm, the company launched the new Emerging Civil War Series a few months ago. Our first book, Simply Murder: The Battle of Fredericksburg, Dec. 13, 1862, came out just in time for the battle’s sesquicentennial. Earlier this week, Blue Ridge PBS in Virginia featured the book prominently, and it’s also been nominated in the nonfiction category for the Library of Virginia’s literary awards. Great things have been happening for the book because of the full-court press Ted’s team has been executing on our behalf. The next book in the series, The Last Days of Stonewall Jackson, will be out in just a few weeks, and the third book, A Season of Slaughter: The Battle of Spotsylvania Court House, May 8-21, 1864, will be out in early summer. The books all include some great work by ECW contributors Kathleen Logothetis, Steward Henderson, and Daniel Davis, plus historians John Cummings and Steph Mackowski. 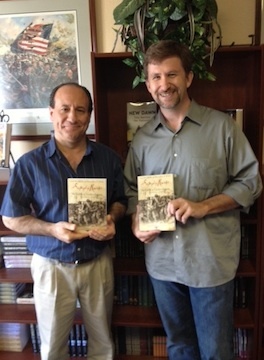 In the months ahead, Daniel and fellow ECW author Phillip Greenwalt will have a book for the series about the 1864 Valley Campaign, and historian Lee White is putting the finishing touches on Bushwacking on a Grand Scale: The Battle of Chickamauga, Sept. 18-20, 1863, which will be out in time for the fall anniversary of the battle. We have other titles in development, too, so look for more great things as the year unfolds. But that’s not all. Aside from the Emerging Civil War Series, Savas Beatie will soon be releasing Chancellorsville’s Forgotten Front: The Battles of Second Fredericksburg and Salem Church. Kris and I are really excited to see this one hit shelves at the end of next month. Forgotten Front is a comprehensive, full-length study of some crucial-yet-overlooked action. Whereas our titles in the Emerging Civil War Series are geared toward general audiences, Forgotten Front is a microtactical hardcover aimed at enthusiasts. Kris and I both have some other projects of similar scale in the works with Ted, too–the Civil War, both big and small, I guess! It’s been a neat challenge for me, as a writer, to go back and forth between audiences like that: one demands complex details and the other shies away from them. Fortunately, both audiences demand well-told, easy-to-follow stories, and on that score, I’m confident we deliver. Veronica Kane (pictured) has been our production manager for Forgotten Front, and she’s been just absolutely marvelous to work with. Sarah Keeney, meanwhile, has been shepherding the Emerging Civil War Series. There are days I’m in contact with her more than I am with my own kids, I swear. Shout-outs go to Lindy Gervin and Yvette Lewis for their work, too. Ted has more great people working with him, but those are the ones I’ve been fortunate to work with personally. I realize I sound like I’m raving, but the professionalism Ted’s entire staff has shown us has really been wonderful. Kris and I are coming off a very poor working relationship with another publisher, so to see a company so enthusiastically devoted to professionalism, and so committed to its authors, has been SO refreshing. We’ll keep you posted as projects continue to unfold. In the meantime, please accept our thanks because these projects would not be possible without the stalwart support you YOU, our readers. When Ted and I do finally get together to smoke those cigars, we’ll be sure to smoke them in your honor. This entry was posted in Books & Authors, Emerging Civil War and tagged Chancellorsville's Forgotten Front, Chris Mackowski, Dan Davis, Daniel Davis, Forgotten Front, Kathleen Logothetis, Katie Logothetis, Kris White, Kristopher White, Last Days of Stonewall Jackson, Phill Greenwalt, Phillip Greenwalt, Savas Beatie, Season of Slaughter, Simply Murder, Ted Savas. Bookmark the permalink. Really cool post to start off a Friday. I speak for Phill as well when I say “thank you” to Chris and Kris for facilitating the project and to Ted for giving us the opportunity to write and contribute to the ECW series. In fact, Phill and I are headed to the Valley this weekend to spend time on the Third Winchester battlefield.